Man caves have grown in popularity over the past few years, and while most guys have them in a basement or spare room, don’t discount the garage as a possibility, especially if you’ve got a car that you want to show off while you watch the game. The garage man cave isn’t just for car enthusiasts. An empty bay can be a great place for a poker game with a table that folds up at the end of the night. However, chances are the client who’s looking for this is a car enthusiast, because he’s looking to convert his garage into an extension of his living space. 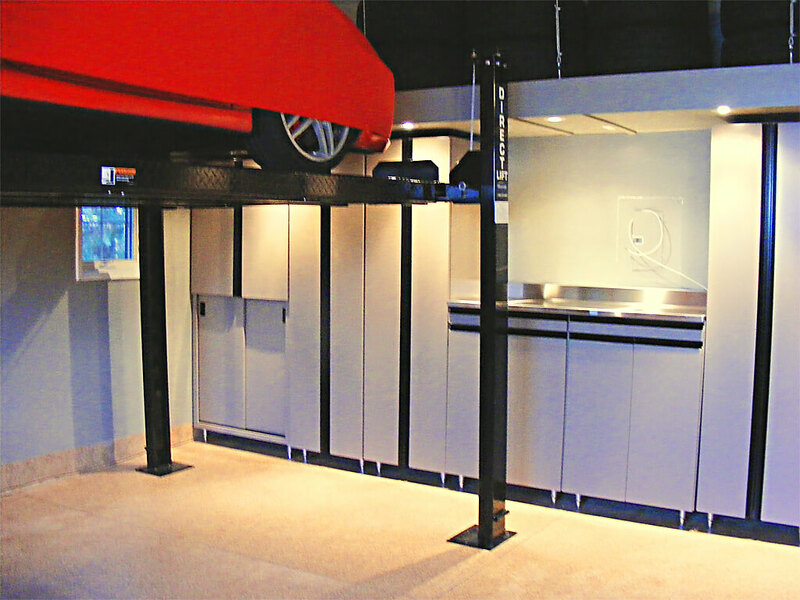 In order to create a garage like this, there are a few factors we take into consideration when planning storage solutions. Exotic car lovers generally like to take care of their own vehicles, which means we need to figure out storage for cleaning supplies and wax. Because the garage is being used as a living space, we want to minimize dust. This means completely finishing the walls with drywall or slatwall and finishing the floors with a polyaspartic floor system. If the client is going to use the space in the winter, a heater is a necessity. There are many options for either gas or electric heaters and an added bonus is that a steady temperature is better for the paint and the oil. Tire storage is also a consideration as a car enthusiast may have multiple sets, including winter or sports tires. If a television is included in your plans, you’ll have to have a cable connection. We can hide the cable and wires behind cabinets so that they are accessible but remain out of sight. 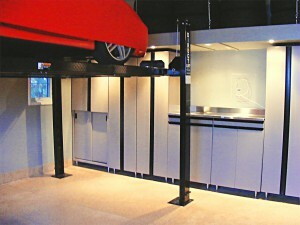 The beauty of creating a man cave in your garage is that the space can still pull double duty. It can fulfill all your storage needs – just park one car on your driveway until the end of the fourth quarter. Click here for a recent transformation where we included space for a bar fridge and a plasma TV in the cabinets.